This is one herb I wouldn’t want to be without. In fact, I consider it a primary herbal medicinal in my pantry. It has a long history and was commonly cultivated in the medieval times. 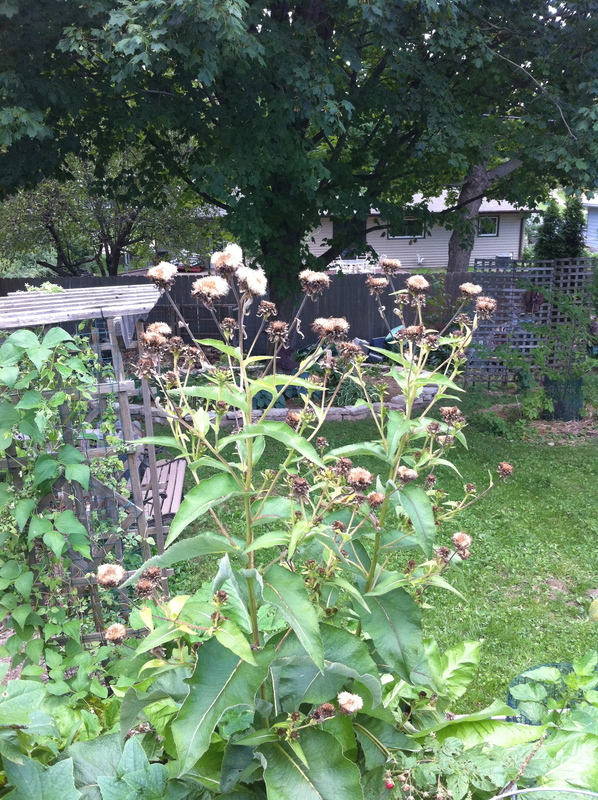 Elecampane easily grows in a garden. Just provide it some fertile soil, part shade to full sun and moisture with good drainage. Let’s take a closer look at this marvelous, healing plant. 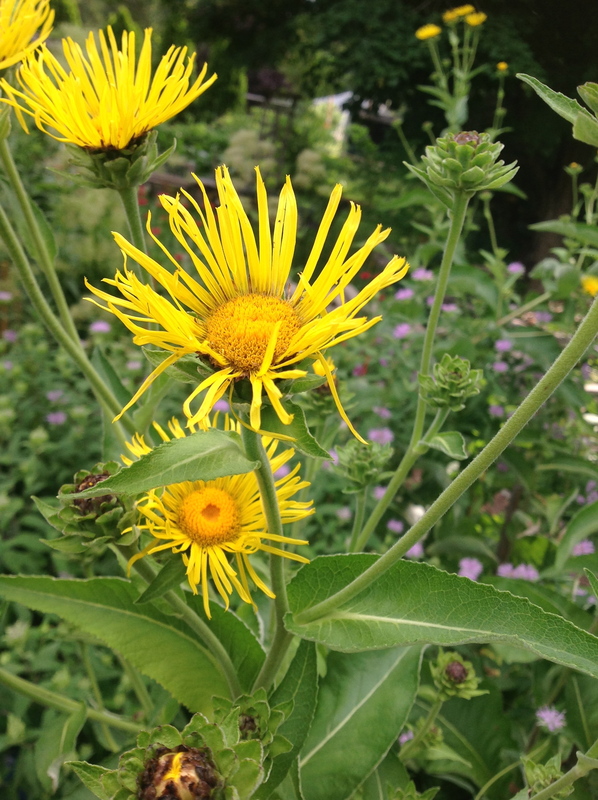 Elecampane in flower – Note leaf attachment & wrap to the stem. 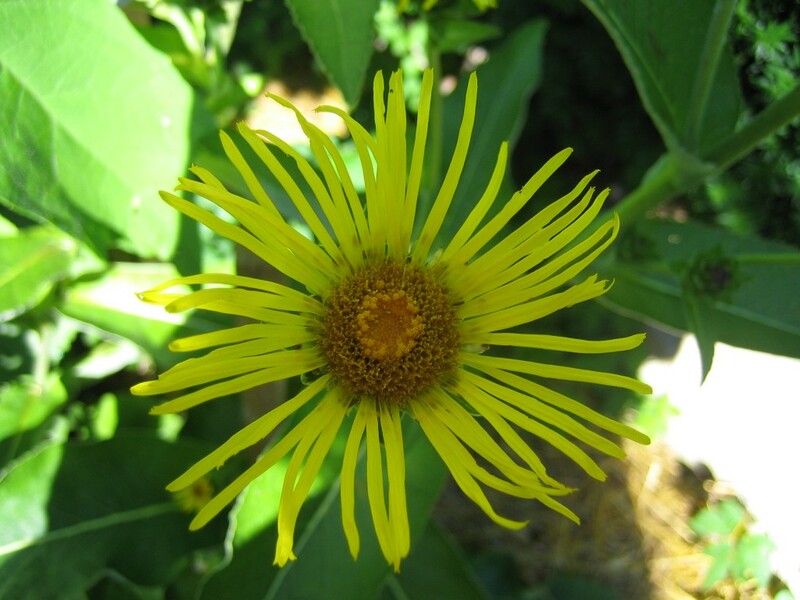 Elecampane likes a fertile, moist ground with good drainage. I’ve grown Elecampane in different parts of the garden from sun to partial shade. I find that the most vibrant plants and roots seem more productive in fertile soil that is not compacted. Keep in mind that Elecampane can reach 4 to 5 feet in height. It needs some space. 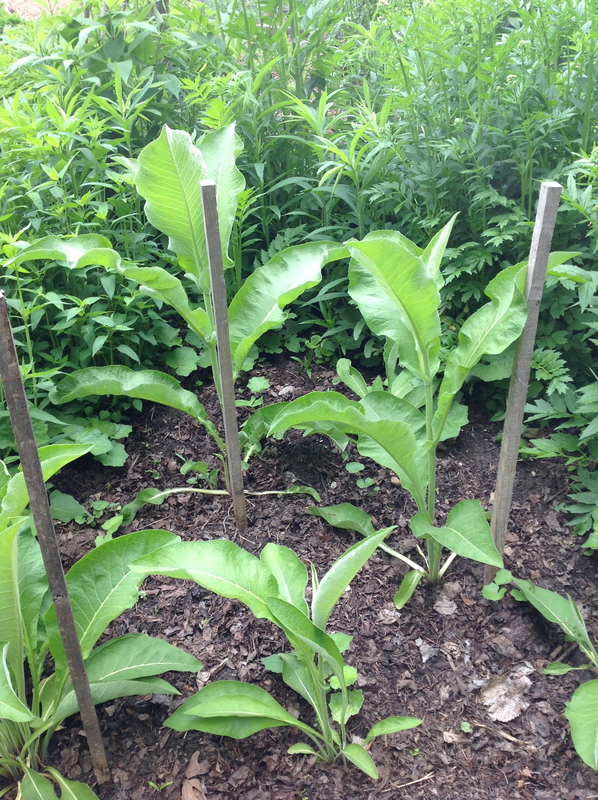 That said, however, I’ve grown Elecampane nestled amidst other plantings. Just allow about 24 inches between plants for the leaf spread. It has a sturdy main stalk. However, the extra branching stems at the top that hold the numerous smaller flower heads tend to weight it over a bit. It helps to provide some sort of staking although I don’t worry about it too much. Many times the plant will just “catch” itself on a neighboring plant and not fall completely to the ground. It doesn’t hurt the plant if bends to the ground. It’s just more attractive upright. The roots are still harvestable either way. 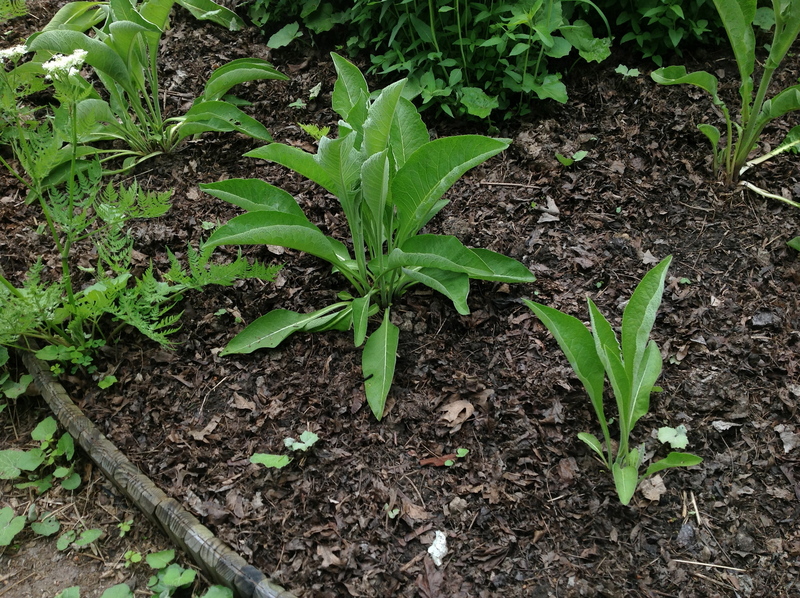 Transplanted plant that re-seeded elsewhere in the garden. Wooden stakes to tie the main stalk to as it grows. 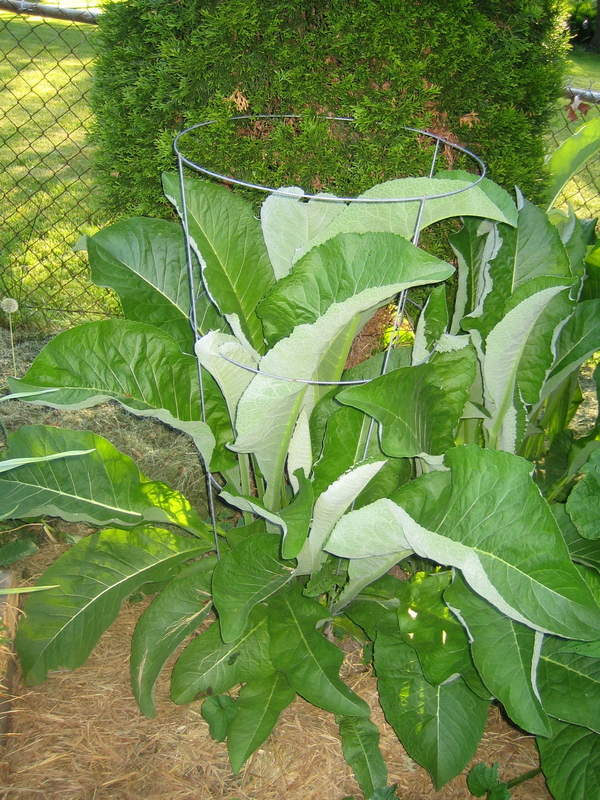 I’ve used sturdy tomato cages in the past and more recently tried placing a couple of wooden stakes around the base and then tying the stalk as it grows upward. 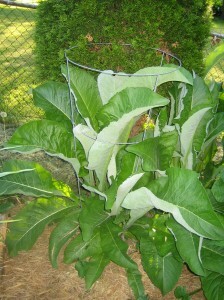 Below is a very stately growing Elecampane with its large leaves. The leaves are coarser on top (and green) compared to the underside of the leaf that has a downy appearance and softer to the touch. This particular plant is about ready to shoot up several flower bearing stems. 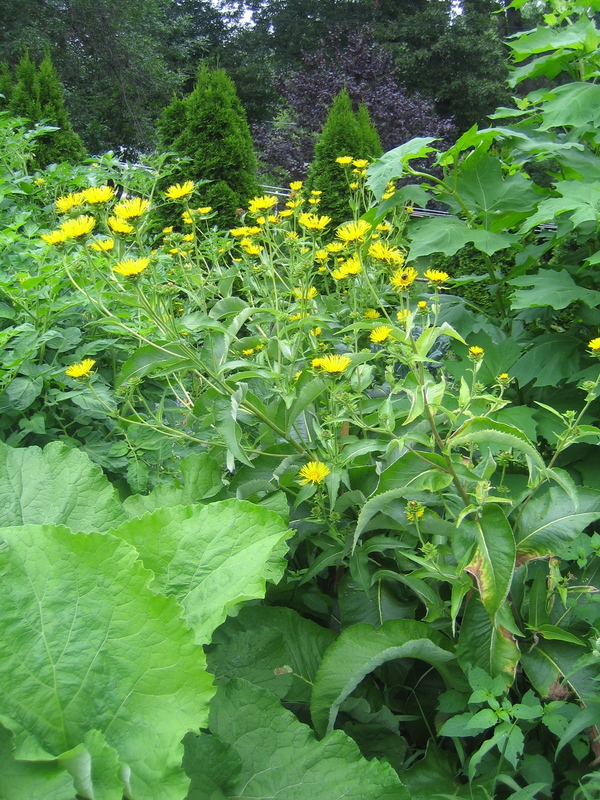 As one can imagine, Elecampane works well behind other plantings in the garden. Although, I wouldn’t dismiss the idea of providing it a central location in a garden pallet. Kind of like an arrangement in a floral bouquet. I’ve grown it both ways. 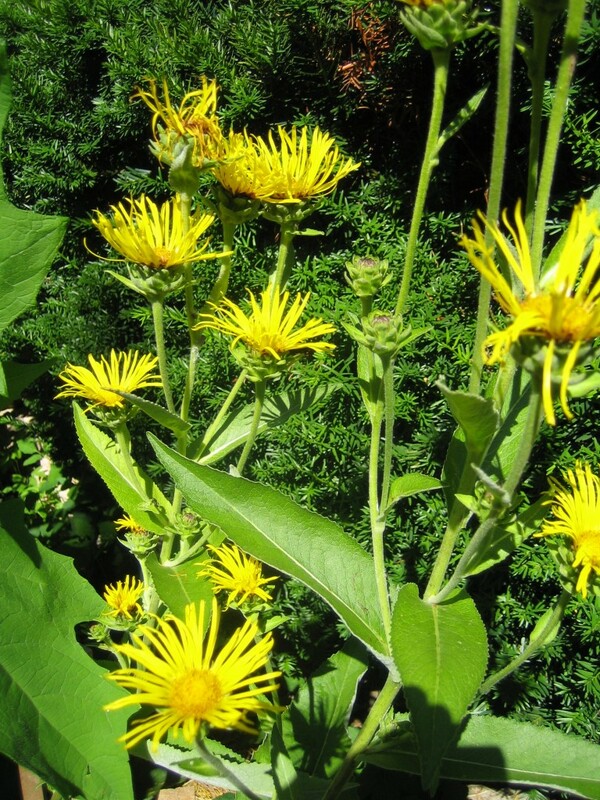 Keep in mind wherever you decide to grow Elecampane that you have accessibility to the plant when it comes time to harvest the roots. 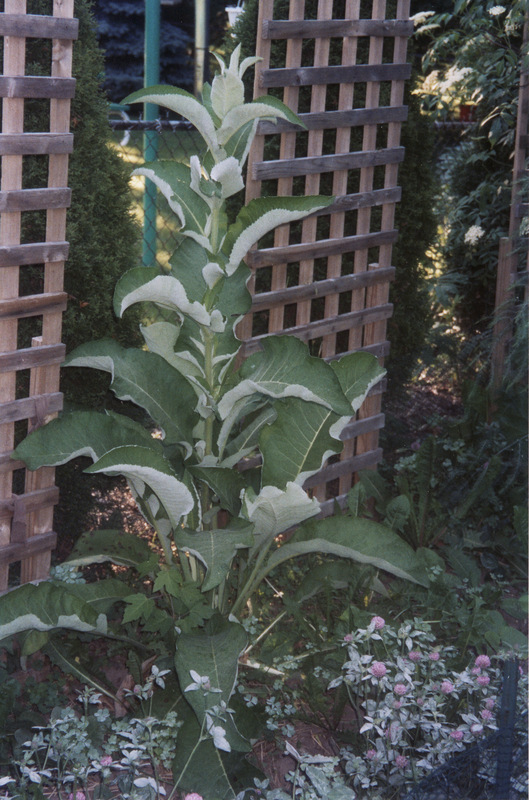 Elecampane before it shoots out smaller stems that bear the flowers. 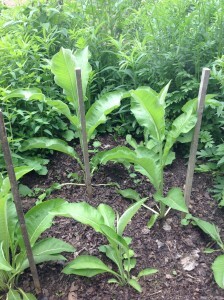 Below is a row of Elecampane plants – some of my first workings with it. They put on a lovely show. Come Autumn I was still able to get in to harvest the roots with other plants surrounding them. The flowers are rather stunning close-up. “Traditionally, the roots are used in European medicine, but the flowers are used for the same bronchial symptoms in China.” (Wood) According to the information I’ve come across so far, the flower medicine is called xuan fu hua and is not the same Inula helenium being discussed here. However, I am curious to work with the flower. If anyone else knows of other resources that discuss the flowers medicinal virtues I’d love to hear about it. A French healer by the name of Maurice Messegue used herbal foot and hand soaks to deliver the herbs healing qualities to the body. In his book, Health Secrets of Plants and Herbs, he suggests putting a handful of the root into one and three-quarter pints of water and adding, some Elecampane flowers if available at the time. Notice how one flower tops one stem and the leaves clasp to the stems. Of course, multiple stems shoot out the top providing a welcomed colorful display in the garden. In early autumn, the flowers go to seed. 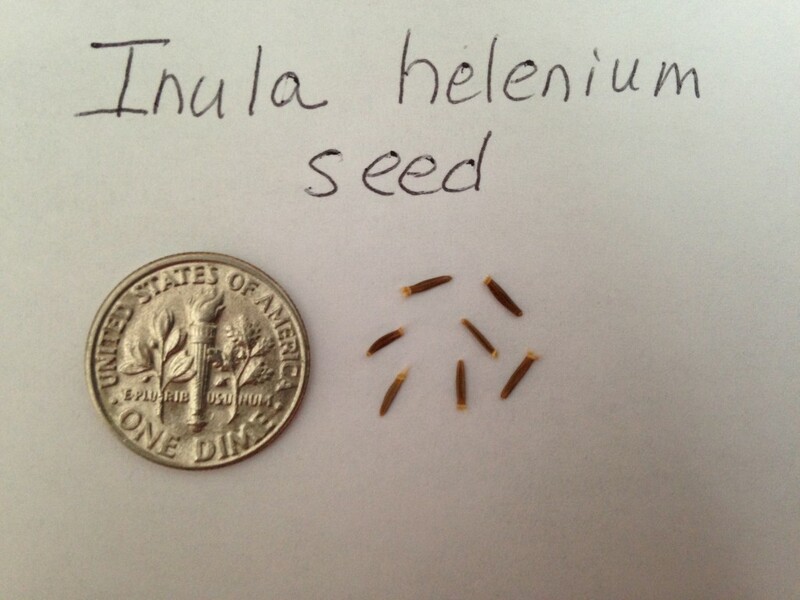 I’ve never found the plants to be overly extended in re-seeding. I’m always happy to find a few shooting up the following spring providing an on-going source of root medicine. I like to use a wide tongue pitch fork when I’m harvesting the root. Gently work the soil to loosen the roots. They actually “pop” up pretty easily. I recommend that if you use a shovel to dig the roots that you start about 8 inches away from the crown and point the blade tip straight down into the ground. You risk cutting off roots if you go at it at an angle with a shovel. Harvesting the roots are pretty easy in loose, fertile soil! Here is a freshly harvest root clump before hosing off the soil. Speaking of which, just turn your hose on the powerful stream like you were cleaning the side of a house and aim it at the root ball. This method makes short order of the process! Now, you can continue a final scrub in the kitchen. You can see the stalks and attached leaves have already turned brown. I harvest the roots mid to late October and even into early November. A sunny, cool day is simply invigorating for the task. Harvest 2 to 3 year old roots with a preference for 2-year-old roots. 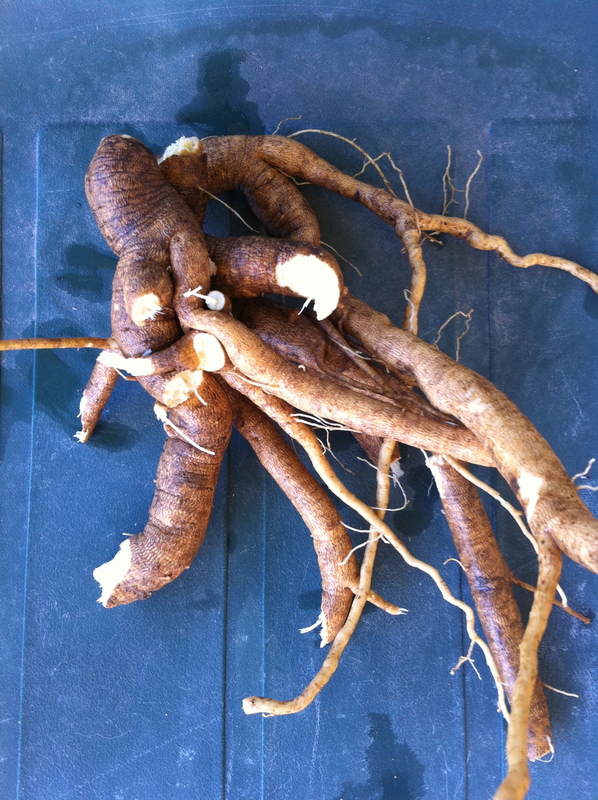 Otherwise, the roots get pithy and woody and are not good for making medicine. Beautiful clump of elecampane roots! Underneath all the soil we find growth “starts” emerging. Once you remove the roots for your medicinal harvest you can re-plant the crown with the emerging buds. I’ve re-planted the whole remaining crowns and found that the next round of roots harvested was less desirable than roots harvested from a single new transplant. 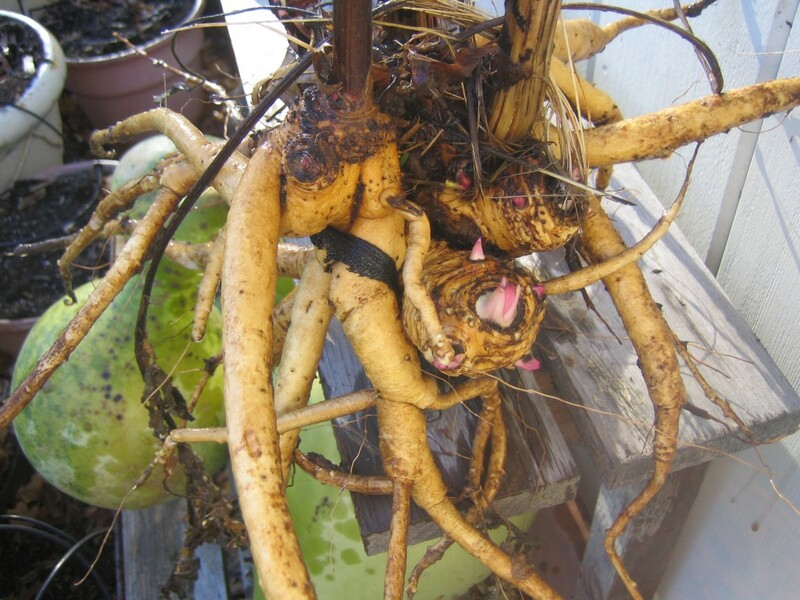 The roots to me just didn’t seem to have the same vitality, abundance or size as the new starts from seed. I plan to try a couple of Maude Grieve’s suggestions this growing season to compare: 1) “off-sets, taken in the autumn from the old root, with a bud or eye to each”, and 2) cutting the root into pieces about 2 inches long, covering with rich, light, sandy soil and keeping in gentle heat during the winter. Sounds fun! 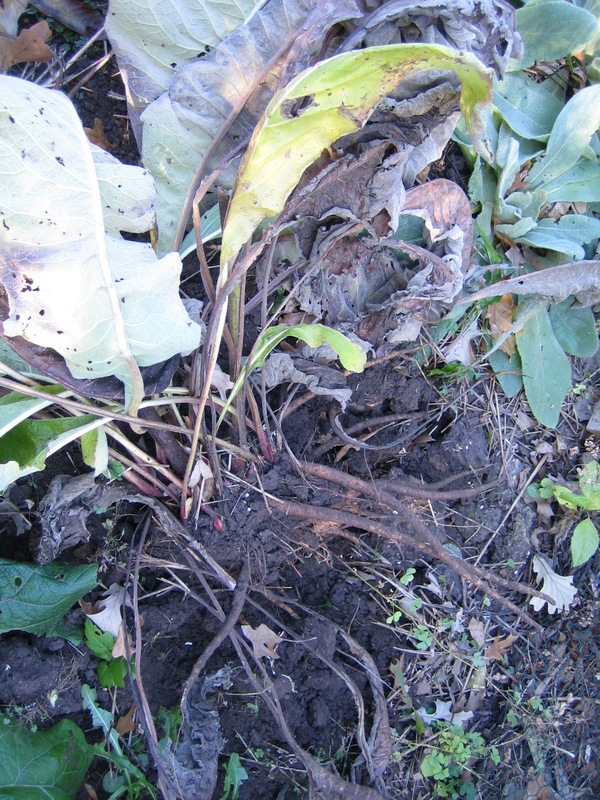 Note the new plant buds jutting out at the surface of the root near the stalks. 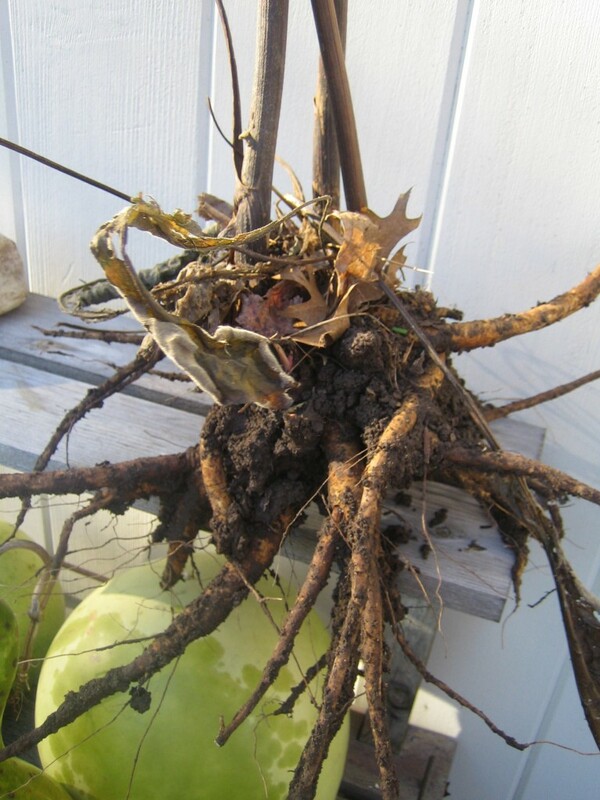 Below are roots with a final scrub and ready to tincture, make honey or dry to use as a favorite winter herbal remedy. SOME OF ELECAMPANE’S HELPFUL WAYS . . . .
Bove, Mary, N.D., An Encyclopedia of Natural Healing for Children & Infants. New Canaan, Connecticut, Keats Publlishing, Inc. 1996. Cook, William, M.D. The Physiomedical Dispensatory. 1869. Ellingwood,M.D., Finley. American Materia Medica, Therapeutics and Pharmacognosy. 1919. Gibbons, Euell. Stalking the Healthful Herbs. New York,David McKay Company, Inc. 1966. Grieve, Mrs. M. A Modern Herbal, Volume I. New York, Dover Publications, Inc., 1971 (originally published in 1931).